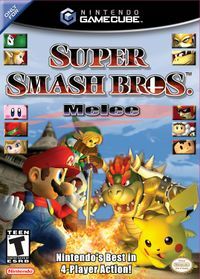 Metroid has appeared in every Super Smash Bros. game to date, including Super Smash Bros. Melee. 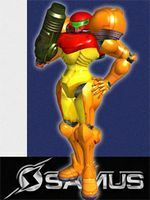 In addition to Samus Aran's appearance as a playable character, other references include character and enemy cameos, stages based on Metroid locations, items and music from the series, and various trophies of Metroid elements. For more information, please visit the relevant Smash Wiki and Strategy Wiki articles. Samus Aran returns as a veteran fighter in Melee with the same five color palettes available in Super Smash Bros. Her arsenal includes the same weapons as in the previous installment, with the addition of Missiles. Planet Zebes: Brinstar appears as a stage for combat, inspired by the original Brinstar area. In many ways it's nearly identical to the Planet Zebes stage from Super Smash Bros., complete with an acid hazard. The large fleshy organism in the background is shaped like a brain, perhaps a tip of the hat to Mother Brain, or even a rudimentary image of her. Planet Zebes: Brinstar Depths is the second Metroid-themed stage in Melee, loosely inspired by Kraid area. Kraid appears in the background of this stage, spinning the central platform occasionally during battles, but otherwise the stage bears little resemblance to any areas of Brinstar in the Metroid games. The Brinstar Escape Shaft appears briefly in the 1-player adventure mode, possibly inspired by a similar shaft in Super Metroid. In this level the character being used at the time must ascend to the top of a large underground shaft using multiple metal platforms within a set time limit. The Screw Attack was introduced in Melee as the first Metroid-themed item. The item can be held, adding a spin to a character's normal jumps that inflict minor damage, or thrown at an opponent, causing them in execute a spinning jump as a disruption tactic. Music from the Metroid series included in this game include tracks 7, 8, and 41. 7: Brinstar plays on the Brinstar stage and is a medley of a remixed Brinstar theme, the "game start" fanfare heard when one resumes a gamefile in the original Metroid, and the original Metroid title theme. 8: Brinstar Depths plays on the Brinstar Depths stage and is a remix of the music heard in the original Metroid when Samus is about to combat Kraid and a short bridge consisting of the item room music in the same game. 41: Samus's Victory is an orchestration of the item acquisition fanfare and is used as Samus's victory fanfare. Samus Aran Complete Class Mode as Samus This intergalactic bounty hunter's full name is Samus Aran. Clad in a Power Suit made by the Chozo race and infused with their enhanced blood, she cleared the planet Zebes of a Metroid infestation. Samus is an orphan, the sole survivor of a Space Pirate raid that destroyed an Earth colony named K-2L. Samus Aran [Smash] Complete Adventure Mode as Samus Samus has an abundance of projectile weapons, making her a long-distance attack specialist. The most powerful weapon in her arsenal is her Charge Shot, but be warned: it can be reflected. Her missiles have homing capabilities, but when fired as Smash Attacks, they fly on a straight trajectory and have boosted power. Samus Aran [Smash] Complete All-star Mode as Samus While Samus's arsenal of missile weapons is indeed formidable, her enemies are in for a rude awakening if they guard against nothing else. Her Grappling Beam captures foes and latches on to walls, and the Screw Attack drags foes upwards in a series of spins that doubles as a recovery move. Samus can also use her Bombs to perform Bomb Jumps. Screw Attack Available in 1-player modes One of Samus Aran's power-ups from the original Metroid, the Screw Attack turns a jump into a rotating attack move. When carrying this item, any character's ordinary jump move will turn into a Screw Attack. By the same token, if you throw this item at an enemy, your foe will spontaneously do a Screw Attack. Kraid Play 50 vs. matches A boss enemy from Metroid. Kraid lives in the depths of Brinstar. He immobilizes enemies with his three red eyes, and his powerful jaws can crush anything. He can also shoot the three spikes in his belly; it's said he often fires them at his prey. Once Samus defeated Ridley and Kraid, the way to Tourian opened. Chozo Statue Available in 1-player modes or Lottery These statues, which provide power-ups to Samus and have some connection with her Power Suit, have been found in many places, most notably Zebes. The Chozo boasted the most advanced civilization in their galaxy. Some say that when they could advance no further, they chose to withdraw and observe other life forms. Samus's Starship Clear Escape From Brinstar in Adventure mode This compact ship is used by Samus as her base of operations. Of course, Samus can't fly it into the catacombs of every planet she visits, so she leaves it on the surface as her sanctuary. Samus can recharge her Power Suit inside the ship, so it tends to be the only safe and secure spot on inhospitable alien terrain. Metroid Available in 1-player modes or Lottery A parasitic life form that can absorb all types of energy, Metroids have strong resistance to most conventional weaponry. To defeat them, Samus Aran had to freeze them with Ice Beam shots and then blast them with missiles. Mochtroids, which look like Metroids, are weaker, with fewer internal nuclei. Ridley Available in 1-player modes or Lottery The head of the Space Pirates on Zebes, Ridley soars through space on wicked wings. Ridley may look like a mindless monster, but he's actually quite intelligent. After the SR-388 incident, where Samus captured the infant Metroid, Ridley took the Space Academy by storm, annihilating the complex and taking the Metroid back. Samus Unmasked Hacking It's said that the orphaned Samus Aran was raised by the few survivors of the Chozo race. They armed her with a Power Suit and taught her the ways of advanced combat; even burdened with her heavy suit, Samus is as graceful as a butterfly. In the Metroid series, it was standard that Samus would remove her helmet and armor if you cleared the game fast enough. This page was last edited on 14 September 2015, at 01:06. This page has been accessed 9,418 times.